Sandra Kaye: Handmade U Show and Tell!!! I found an art retreat in Omaha, Nebraska...that I really wanted to try out. Here I am a day early....art journaling in the dinning room...waiting for the fun to begin. I got to shop in some very cool stores that I have never been in before. Archiver's was just wonderful!!! We also went to antique malls too!! This store is the bomb!!!! I LOVE this store...everything you could ever want in the craft world is in this store!!! If this store was in my town....I would go completely broke in very little time at all. Here I am with Rachael McGough on the left...our (Hostess extraordinary) Me in the middle .... and Michelle Gellar. These two ladies pulled off an amazing retreat!! Thank you so much Ladies...I really enjoyed myself!! And box trades!!! 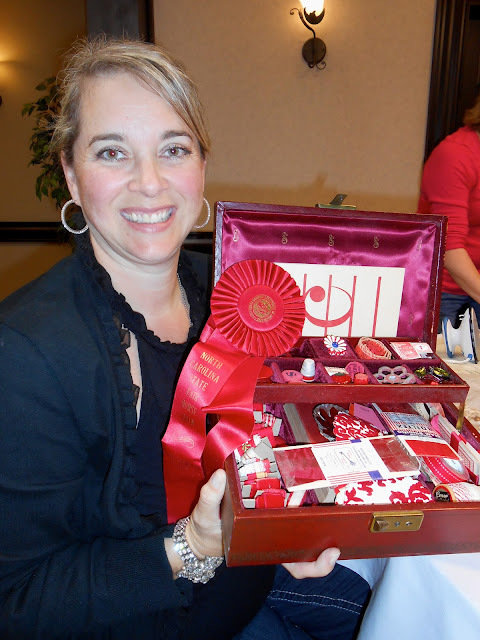 We each received a trade partner who we made our boxes for...to their color choice of ephemera...This is Hope Ellington...my partner looking at the box I gave her!!! I really enjoyed finding all your treasures Hope!!! Here Hope is holding my Box that she put together for me!!! I asked for the color RED!!!! I love my box...it was jammed packed with yummy redness!! Thank you Hope!!! You out did yourself. Here I am with a bunch of Ladies working on one of our make and takes!!! First class... Hope Wallace Karney. Parlour Journal of Thoughts and Musings. Here is my kit at my desk! That envelope is made out of wall paper!! Very fun class. ....these are all the books that were made in Hope's class!!! Be sure to visit her blog!! She has great e-course you can take!! Next was Liesel Lund's class...Children's Book Journal. Above Liesel and I are holding our own books!! I had a blast in this class. I am a color girl...and Liesel is just like me in that department!! Here are the classes books!! We took apart these children's books...and remade them with different pages and papers on the inside!!! Again...I will show you my book as I get stuff in them!! I absolutely love to see art journaling messes!!!! This is the desk of just two ladies :O) The whole room looked like this!! Of course....I need to show you my haul!!! On Friday night they had a vendor night!! I bought just a few things!!! LOL!!! The packets you see are just filled with paper ephemera!! ...she was making scarves out of this lovely yarns and ribbons...I caught her playing around with them!! LOVE this photo!! It fits her personality also :):) Be sure to visit her blog..she has more HU pictures up right now too!! Check it out here. Well...I took 105 photos this weekend...and only showed you 21 photos!! I just wanted to give you the idea of all the fun that was had!! If you want to find out more about the next Handmade U...check out Rachael's blog for more info. Thanks for stopping by!! Be sure to say Hi..I have missed my web friends!! How much fun that had to be. Everyone looks so happy! Oh Sandie, what fun you had! You look so gloriously happy in all the pics...your wonderful smile is so contagious...I am smiling right back at you! So glad you were able to experience such a fantastic time. Will look forward to seeing even more of your smiles and creations! Great way to spend some time. Fun and art. Will be nice to see more of your work. Wow what a great trip you had.Thanks for sharing your lovely pics. Can't wait to see you this week!!! Wow! It does look like fun! Will check out some of the girls blogs you mentioned. Will look forward also to seeing your little books on the inside when finished!